The aim of Renew Africa is to promote Pastoral renewal by empowering individuals and communities to encounter God in everyday life and to connect faith with action through Small Christian Communities (SCC). It is a parish-centred, diocesan-wide process, focusing on evangelization and spiritual renewal. It aims at building SCC’s that can help build a self-sustaining church. Renew Africa aims at the renewal of Small Christian Communities. It is a practical means of evangelization. It promotes Bible Reading among Catholics and Biblical literacy. It promotes Action on behalf of Justice & Peace. It promotes a Catholic spirituality of healing. It helps our SCC’s to focus on God, faith and service. 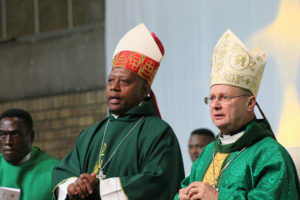 Renew Africa focuses on the formation of laity. It has many workshops and seminars to help empower laity in leadership and facilitation. This season reminds us that Jesus is Lord and Saviour. How do we encounter Christ and develop a deeper relationship with him? This season is the foundation of all other seasons. All of us will be asked to renew our commitment to Christ and to invite him once more as Lord of our lives, our families, our work, our parishes, our society. This season allows us to learn and to experience the following: What is healing? Healing the body of Christ. This is a season for inner peace and wholeness. How do we do healing in our Catholic Tradition? Through prayer, sacraments, etc. During this season, our facilitators and the Liturgy team will be trained on how to organize a healing service for the parish. The healing service must be celebrated before the end of this season. This season will assist us to understand what it means to be church. How do we come to understand that we are the church? How do we become a truly self-sustaining church in vocations, finance, ministries, etc.? How can we stand on our own? How do we use our talents and creativity for the kingdom of God? This season reminds us that if we, as Catholics, do not evangelize, and if we do not know how to evangelize, then we become targets of Islamic and Pentecostal evangelization. The work of evangelization belongs to all of us. We must have the passion to share the Good News of salvation with others. In the spirit of Justice, Peace and Reconciliation – Renew Africa helps us to move from maintenance to service and outreach. The church according to Africae Munus of Pope Emeritus Benedict XV1, must be at the service of Justice, Peace and Reconciliation. How do we deal with our pain and with our past? How do we help our society which is being consumed by corruption, materialism and violence? How do we treat the poor and the marginalized? Prayer – for self, others, church, society and the environment. Learning – To grow in faith, relationship with God, learn from each other, learn from the teachings of the church / Scriptures. Sharing– Telling our stories, sharing the Word of God; sharing from the heart, not preaching. “How does work or life experience speak to me now? How do I go inside and search deeper on a level of faith – and then share that with others”? Once I have shared then I don’t share again until others have had a chance to share as well. Mutual Support- Be there for one another. We are One Body. Mission – Call to action as individuals and a community. Every season will challenge us to do something. To choose an outreach project. To respond to the Word with action. Faith without works is dead. Renew Africa helps us to experience mutual support from our faith sharing group (SCC) and from the parish as a whole: (We share our joys and pains. We encourage families to become united, loving and supportive families to all members of the family and to the church). Our faith sharing communities can be a great source of support during bereavements. There is openness to learn. They grow in faith. There is healing and sense of belonging. There is a spirit of communion. They encounter God and one another. PLEASE REVIVE SMALL CHRISTIAN COMMUNITIES. FOR OUR TOWNS AND CITIES WHERE SCC’S DO NOT EXIST, FORM FAITH SHARING GROUPS. ST MICHAEL IS SUCCEEDING IN DOING THIS. INVITE THEM AND LET THEM HELP YOU. PEOPLE ARE SIGINING IN, TO BELONG TO A FAITH SHARING GROUP!!! WHAT ARE SOME NEGATIVE EXPERIENCES OF SMALL CHRISTIAN COMMUNITIES IN OUR DIOCESE? Sharing: some people find it difficult to open up. Gossip. Money is sometimes at the centre. They want power; they lack content (resources) Problems with places to meet. Problems of time. Leadership problems- They are bossy. Some people insist on being animators even during those times when they do not have talents. Facilitating is a weakness. Lack of time to animate the SCC’s. Renew Africa will provide resources, faith sharing booklets to assist us and it will train our faith sharing facilitators. The books are translated into various languages. What is the role of the Priest in Renew? He must be passionate about Renew and promote it in his parish. Call forth leadership. Identify talents. Approach people with skills and invite them to come and serve in the Renew team. Collaborate with other teams in the parish. Support SCC leaders and Renew Parish Core Community. Encourage them. Hold meetings with them. Pray with them. It is a Spirit-driven process. In every things you do and every decision you take which involves Renew, you must consult the Holy Spirit. That is why, in Acts 15 the Apostles could say: We and the Holy Spirit have decided! We must discuss leadership. Pray about calling forth the leaders. We must collaborate. The priest does not have to be the leader. The animator/ coordinator, who is a lay person must have great leadership skills and communications skills. The team can meet and train clusters of parishes. The Parishes Core Community becomes automatically a sub-committee of Parish Pastoral Council. They are accountable to the PPC. Volunteers will be required to invite people to join or to form SCC’s, to help with publicity and to lead parish missions. The PCC does not have to do this on their own. They can actually create other teams in the parish to look at some of these responsibilities, eg Mission, sign up Sunday, Healing, etc. -Prepare who is going to help me to identify members for Parish Core Community? -Present reflection, Pray, look for people who are not already too involved. Don’t decide for them; look for people with skills. e.g. marketing and finance . Invite them and give them a chance to say yes. Bring a list of names and pray about the list. Discern. We hereby agree on a name. Team invite them. Interview them and make a follow-up. Parishes become more vibrant, people grow confidence. People evangelize. They witness and this leads to many conversions. Growth and ministry, catechism and other parish ministries. Justice and Peace projects begin. The Apostolic Nuncio said that his parents are still members of Renew after 34 years. He also said that his vocation is as a result of the presence of Renew in his family. Forming of Parish Core Community (Leadership Renew Africa and Evangelization) Invitation Ministry. Workshops have been organized. 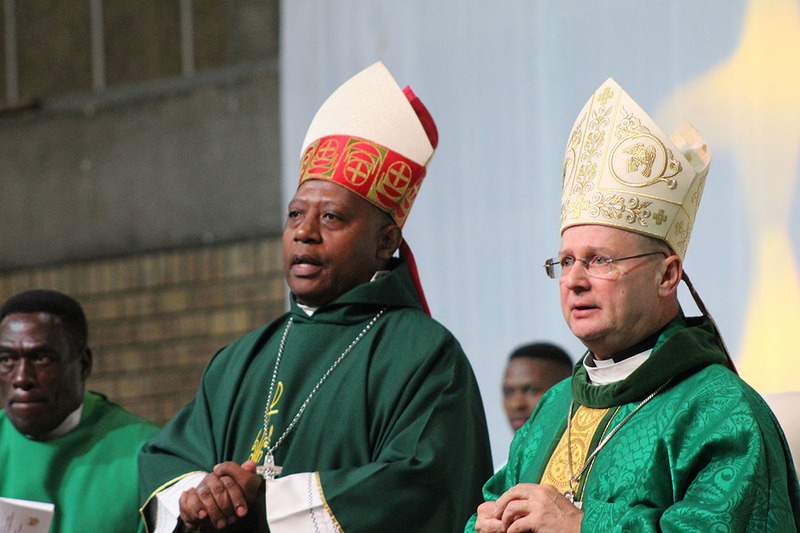 People have been trained by our team from Johannesburg and Pretoria Archdioceses. We will organize more training for SCC leaders, Faith sharing facilitators and liturgy teams. Make sure you send your people because our resources are limited and we cannot afford to send our guests facilitators to every parish. Let us unite and make Renew Africa our passion. The Lord we give us the strengths and the means. THANK YOU FOR YOUR PARTICIPATION AT THE LAUNCH OF RENEW AFRICA. THANKS TO THE CLERGY, LAY LEADERSHIP, OUR EVENTS AD HOC COMMITTEE, THE RENEW OFFICE AND THE CHANCERY FOR YOUR OUTSTANDING WORK. MAY GOD BE GLORIFIED. MAY YOU BE RICHLY BLESSED. THANKS TO THE FR DON, PHILLY AND ST MICHAEL’S PARISH. AWARE OF OUR STRUGGLES, THEY RESEARCHED AND IDENTIFIED A TREE THAT CAN BECOME OUR DIOCESAN RENEW TREE, AN AFRICAN OLIVE WHICH CAN WITHSTAND ALL TYPES OF WEATHERS AND CLIMATES. THEY SPONSORED OUR PRAYER CARDS AND ANIMATED THE PRAISE AND WORSHIP AND MASS. WE THANK THE CECILIA CHOIR, OUR SEMINIARIANS, THE LITURGY MC.S, PROGRAMME DIRECTORS, ST ANNE AND BARADI FOR CATERING, MEN’S FORUM AND ST JOSEPH FOR SECURITY, CATHEDRAL URSHERS AND THE CATHEDRAL FOR SACRISTY WORK, DRUM MAJORETTES, BOYS OF ST KIZITO AND MASOLENYANA, BRO THUTO FOR A WONDERFUL RENEW POEM, ST CECILIA FOR THE RENEW SONG THEY COMPOSED, OUR GUEST SPEAKER SR ONIA, THE MAIN CELEBRANT, ARCHBISHOP PETER WELLS AND MONSIGNOR ROMAN. THANKS TO DUNCAN AND OUR GUESTS FROM THE JOHANNESBURG DIOCESE, NOKO FOR CANDLES AND GIFTS FOR OUR GUESTS, OUR SPONSORS AND BENEFECTORS FOR SECURITY, STAGE AND SOUND, OUR DEANERY PASTORAL COUNCIL AND THE YOUTH FOR CLEANING THE HALL, FOR OUR PROCLAIMERS OF THE WORD, INTECESSORS, PROCESSION YOUTHS OF ST MARTIN AND ITSOSENG. MANY THANKS FOR THE GIFTS FROM WEDELA AND KOKOSI. THANKS TO ALL THOSE WHO HELPED WITH LOGISTICS, OUR DIOCESAN CORE COMMUNITY LED BY FR MANANA AND MRS MANYOBE, RENEW PARISH CORE COMMUNITIES AND OUR ULULATING WOMEN FROM VARIOUS SODALITIES. My apologies to the youth of Potchefstroom. I do not know what happened, but we had given you a slot, to sing. I need to understand what happened and we must see how to rectify this mistake. It must not happen again. Our youth are the present and the future. I encourage you to plan your own PARISH RENEW LAUNCH MASS, IT MUST BE DONE BEFORE THE END OF AUGUST. Let it be special. It must include the planting the of the Renew Tree. You bless the Renew Core Communities and other Renew teams in the parish. Renew T-shirts of your deanery to be worn on the day, the banner to be hoisted, the tree to planted, the renew prayer to be recited and the Mass and Homily to focus on Renew Africa. You can also bring in your own creativity there. Prayer cards are available at R2. They are available in various language. T-Shirts are available R110 SMALL. R130 All other sizes. 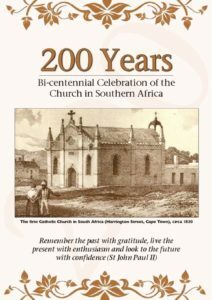 Banners for outstations can be ordered through the chancery for R400. Pay first and then we place an order for you. May God bless you and give you a new spirit of cooperation and love in your parish.